It will be the first sworn public testimony from Jeff Sessions, a longtime former senator, since he was confirmed as the nation's top law enforcement officer in February, and comes as political intrigue pulses through the US capital following explosive testimony by James Comey last week. Jeff Sessions appears before the Senate Intelligence Committee over his Russian contacts. 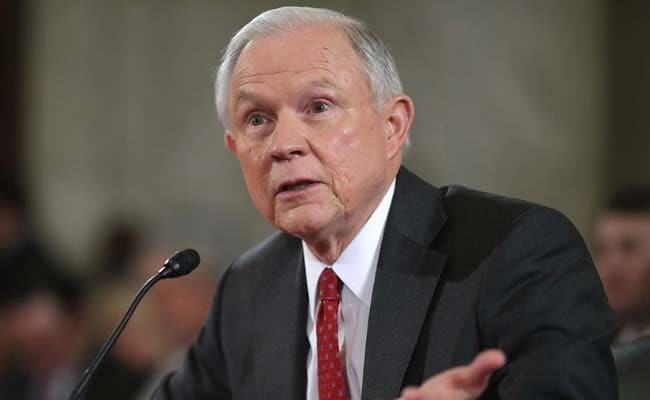 Washington, United States: US Attorney General Jeff Sessions testifies before Congress Tuesday in another point of high drama regarding the Russia election meddling probe, under pressure to explain his role in the scandal battering President Donald Trump's administration. Sessions appears before the Senate Intelligence Committee at 2:30 pm (1830 GMT) for what will be a closely-watched grilling over his Russia contacts and how he was involved in the firing of FBI director James Comey. It will be the first sworn public testimony from Sessions, a longtime former senator, since he was confirmed as the nation's top law enforcement officer in February, and comes as political intrigue pulses through the US capital following explosive testimony by Comey last week. Trump has expressed frustration with Sessions, one of his earliest high-profile campaign backers, who has recused himself from investigations into alleged Russian interference in last year's election, and possible collusion with the Trump campaign. The Justice Department has said Sessions recused himself because his involvement in the campaign, but in his dramatic appearance last Thursday, Comey said the Federal Bureau of Investigation was aware of information that would have made it "problematic" for Sessions to be involved. Trump sacked Comey in early May. Given that as FBI director Comey was overseeing the Russia probe, the firing has led to questions about potential obstruction of justice. Rumors have since circulated that the president may seek to sack special counsel Robert Mueller, who was appointed to head the high-stakes investigation following Comey's ouster. But Sessions, who recommended Comey be fired, may end up declining to discuss his conversations with the president, invoking the so-called executive privilege that allows the president and others in the administration to keep their internal discussions private. Whether he does so "depends on the scope of the questions," White House spokesman Sean Spicer told reporters Monday, saying it would be "premature" to say how Sessions will act. Although Sessions backed Trump's campaign, he was also one of the first administration officials to fly into turbulence. During his January confirmation hearing, he failed to disclose two meetings he held with Russian officials. "He didn't tell us the truth," Democratic Senator Patrick Leahy told MSNBC Monday, saying there were now indications he had a third meeting. "Let's find out under oath what it was," Leahy said. Sessions heads to Capitol Hill in a perilous position with his boss, with Trump reportedly growing displeased with his attorney general, notably over his recusal on the Russia probe. He may also face questions about comments by Trump confidant Chris Ruddy, chief executive of Newsmax, who suggested Monday that the president was considering firing Mueller, the special counsel appointed by the Justice Department to lead the FBI's Russia probe. Democrats have bristled at that prospect, and several experts have warned that such a move could prove politically disastrous. House Speaker Paul Ryan, the top Republican in Congress, said Tuesday he has "confidence" in the special counsel. "I think the best thing to do is to let Robert Mueller do his job," he said. In a separate Senate hearing, deputy attorney general Rod Rosenstein -- who following Sessions' recusal from the Russia probe is the official with authority to fire Mueller -- told lawmakers he has seen no evidence of good cause to do so. Asked if he would fire Mueller should Trump ask him to, Rosenstein responded: "I'm not going to follow any orders unless I believe those are lawful." Sessions may be under a further cloud after Comey suggested the attorney general may have failed to take appropriate steps to protect the FBI chief from political pressure from Trump's White House. At the conclusion of a February 14 meeting, the sacked FBI chief testified, Trump urged everyone else but Comey to leave the Oval Office, including Sessions. Comey said the president then leaned on him to halt an investigation into one of his top aides, former national security advisor Michael Flynn. Comey recalled that he felt "something big" was about to happen, and "my sense was the attorney general knew he shouldn't be leaving."